I am Colin Warfield a professional painter and decorator with over thirty five years experience in the trade. 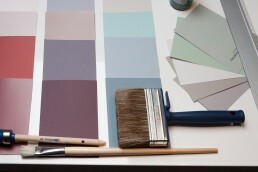 I provide a high quality, reliable, professional service for your interior painting and decorating projects. You can trust me to provide you with consistently high quality workmanship, at a very competitive price. I will supply a free no obligation fixed quote with no hidden costs. For many people, a simple pot of paint from the local DIY shop is their first port of call when they’re looking to redecorate. But there’s a big difference between retail paint, which members of the public can purchase, and trade paint, which is available to decorating professionals like us. The formulation of trade and retail paints is very different. The quality of professional trade paint is much higher than retail paint. It’s designed to go further on every surface, and while retail paint might need three or four coats of paint to get the desired finish, trade paint will do it in significantly less. This is because retail paint suffers from something known as “low opacity”, which refers to the level of light that can get through it. Trade paint also provides a much nicer finish and reduced fading, as the ingredients, such as the pigment (colour dye), are far superior to those of retail paint. This is particularly important if the colour you want for your surface is a bold one or intended as a feature wall. Forget the assumption that decorators only use trade paint because of the price difference. Although buying in bulk does often reduce costs, it’s the quality of the paint that’s important. In fact, when comparing how far trade paint goes compared the retail paint, the price you pay for numerous tins of poorer paint is matched by fewer high quality ones. As much as you may have your heart set on a particular pot you spotted in the shops, let us select a similar product we know and trust to do the best job for you. If you ever get to visit a trade paint supplier, you’ll notice that they don’t have products for specific rooms. A retail shop will have specialist paint for your kitchen or bathroom, or self-priming paints which promise you’ll only need a single coat to cover the surface. In our experience, these products rarely deliver their promises, and trade paint is much better equipped to withstand the demands of your household. Looking for a decorator who knows their job as well as their paint? CJW Decorators purchase trade paint directly from trade suppliers, so not only can costs be kept down, but you can be sure of the very best result.